Ahh, a cozy summer read to bring poolside…. 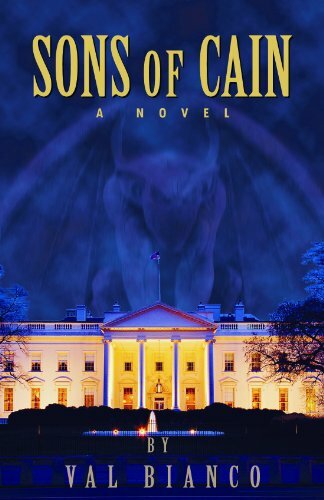 Those would not be the words to describe Sons of Cain by Val Bianco. On the recommendations of many friends, I finally got around to getting a copy to read for myself. I first opened it up on my Nook, saw the page count, and then proceeded to say, “I’m never going to finish a book this long, not with the other deadlines I’m facing!” Fear not, though. Don’t let the page numbers fool you: it’s a speedy read. It has everything: Catholic clerics behaving badly, conservative hypocrites, secret societies ruling the world from behind closed doors… wait, what?! Didn’t that book already get written, like, a bazillion times over? Not like this, my friends, nothing like this. I really liked how the author drew up a world where not only demonic influence was portrayed realistically, but angelic influence was as well. What I liked even more, however, was that the characters didn’t fall into the typical mainstream biases, where all liberals are good and all Catholics are bad. On the same note, however, Bianco avoided the pitfall into which so many Christian writers tumble headlong: that is, where all the liberals are bad and all the Christians (in this case Catholics especially) are good. Bianco made a courageous choice in showing how depraved people can be and that “faith” can indeed be used to garner power to evil ends. He also drew a female lead who was far more dimensional than the average chick in an action-packed, blood-guts-and-guns thriller like Sons of Cain. Considering I’m more of an Austen and Bronte girl than a Clancy or Brown girl, that’s a pretty huge compliment. I was impressed especially by how Bianco handled the resolution of the novel’s romantic tension without violating anyone’s vows. I recommend Sons of Cain with the following caveats. If you, like me, tend to skim over long, detailed scenes of violence, you may find yourself skimming a bit more than expected. Also, towards the end, the editing seemed to need a great deal more polish than it got–not enough to make me stop reading, because the storyline was compelling, but still, enough for me to mention it as a caveat. Lastly, I had some trouble with the vigilante-ish leanings of the good guys. Yes, I understood where they were coming from, and their violence was never, ever poorly motivated; I was just uncomfortable, morally-speaking, with how it was justified in the text. Perhaps a better moral theologian than I could address that better, but I didn’t want to recommend the book without mentioning that issue. I’m trying to figure out if Val Bianco is our Dan Brown or Neal Stephenson. Either way, Sons of Cain did get me thinking–and praying–and those are always good things.